Shore-based marine radar techniques have recently proved to be an excellent tool for monitoring erosion and accretion in the dynamic nearshore area through repeated and automated large-area surveys. The ability to routinely survey intertidal areas has always been logistically challenging and expensive due to the limitations imposed by the tides, weather and access. Advances in remote sensing techniques and the development of new data-processing algorithms have made the surveying of these areas much more cost-effective. There is a global need for greater awareness of the sedimentary dynamics of intertidal regions. These seldom surveyed areas are host to a variety of vital coastal resources, both social and physical. In particular, intertidal zones often serve as a crucial buffer zone between high energy waves, tides and currents and coastal developments such as ports, harbours and residential areas. In many locations the integrity of these buffer zones is being severely degraded. The results of mismanagement of coastal areas can be expensive and damaging to people, environments and businesses operating in coastal areas. Unmonitored sedimentation can lead to costly increased dredging requirements and erosion can increase the risk of flooding and damage to coastal defences. High traffic subtidal areas such as shipping channels, harbours and anchorages are generally routinely surveyed and dredging routines are well established by port authorities and coastal managers. However, the adjacent intertidal regions are often woefully under-surveyed. Frequently, trends of sediment migration, local hydrodynamics and patterns of seasonal change are known only anecdotally and vary significantly in their extent over inter- and intra-annual timescales. The rapidly deployable radar survey platform (Figure 1), developed by Marlan Maritime Technologies Ltd provides the ability to cost-effectively monitor long-term changes in these areas without anyone getting their feet wet or their boats grounded. The radar-based system provides advanced warning of adverse sedimentary activity, volumetric information on sediment movements (especially useful for monitoring beach nourishment schemes) and broad-scale indications of beach system health, delivering a wealth of previously difficult-to-gather information to coastal managers. Marine radar has been used as an oceanographic tool now for several decades. However, its popularity has increased due to recent advances in computing power, data storage, video digitisation and new data-processing algorithms. Researchers in the 1980s determined that radar is capable of imaging ocean waves and could be used to infer water depths and near-surface currents through linear wave theory. These ‘wave inversion’ techniques were developed over the next few decades and commercialised, but can still struggle to resolve the fine detail needed to monitor the high spatial variability typical of intertidal zones. This shortcoming led to the development of the temporal radar waterline method by researchers at the National Oceanography Centre, the University of Liverpool and Marlan Maritime Technologies Ltd. in a three-year project funded by the Centre for Global Eco-Innovation and the European Regional Development Fund. This technique uses the radar-imaged sea surface (Figure 2) and an accurate record of tidal elevations as an altimeter to measure tidally-driven water level elevations at each pixel in a radar scan with a maximum radial working range of 4km (Bell et al., 2016); the effective range can be extended by using larger, more powerful antenna and mounting the scanner higher to alleviate shadowing. The new approach differs from more traditional waterline-based methods by altering the procedure from that of detecting precise waterlines in individual images, to associating the temporal pattern of wetting and drying at each pixel with a known tidal record. The developed technique is able to monitor extremely complex geomorphological environments. Initial research and development was carried out using a three-year dataset collected from the Dee estuary, northwest UK. This estuary has a tidal range in excess of ten metres on high spring tides and a very complex morphology with large areas of intertidal sandflats, subtidal channels, mudbanks, saltmarshes and rocky areas. Figure 3 shows the location of the study site, the radial area highlighted shows the extent of the radar survey from its position on Hilbre Island in the estuary mouth. This 2.5m radar antenna derived intertidal topography within a 4km radial range with a gridded 3m spatial resolution. This technique is still at a relatively early stage of development and in order to validate the technology and enable its deployment commercially, the results were compared to an airborne Lidar survey. Figure 4 shows the radar-derived elevations over the same area covered by a Lidar survey flown at the same time. Figure 5 illustrates the Lidar elevations, it is clear that the radar system is able to derive the major features of the topography including complex channels and bedforms. The radar-derived elevations were for the most part within +/- 20cm of the Lidar results and areas of poorer accuracy were observed in a series of linear features at longer ranges, indicative of intermittent shadowing reducing the signal to noise ratio from these areas. Elevations derived by the radar represent the mean elevation over two weeks, while the Lidar is a snapshot in time so there will inherently be some differences. While the absolute accuracy of this method is currently lower than modern Lidar, differences in elevation are consistent between surveys as shown by a stability analysis (in Bell et al. 2016). This stability means that observed changes over time are a good reflection of actual morphological change being observed by the radar, allowing moving sedimentary features to be detected and areas of erosion and accretion detected with high sensitivity. Significant changes in the morphology of the Dee estuary were detected over three years of continuous radar observation. Multiple intertidal bars with wavelengths of the order of 100-200m and crest lengths in excess of 200m were observed migrating onshore from the nearshore zone and welding onto the beach over a course of several seasons. Bedforms were observed to flatten in winter during the stormy season and recover during spring and summer (Bird et al. In press). Video 1 shows this phenomenon on a beach at the mouth of the Dee estuary. While in the demonstrated case this movement was very benign, similar large scale migrations of sediment can cause great disruption to operations in coastal environments if undetected. Examples of this kind of disruption include: exposure of sea defence foundations, blocking of cooling water pipes at power stations, blocking of channels at smaller ports, harbours and marinas, in addition to potentially rapid infilling of navigation channels at deepwater ports. In addition to direct observation of migrating sediment, this technology is also able to provide an overall indication of ‘beach health’ by tracking volumetric change throughout seasonal cycles (Bird et al. In Press). There are some limitations for this type of survey. The radar must pick up sufficient signal from the sea surface to create an effective image, so tidal areas that are very well sheltered, such as up-river saltmarshes and mudflats, may not be best suited to this technology. Experiments are underway with different radar antennas and sensors to try and survey these problematic areas. Some locations have a very small tidal range combined with steep gradients at the beach, and therefore the area exposed by the rising and falling tide would be relatively narrow and thus a multibeam survey would likely be more applicable as the survey vessel is not time-limited by the tide. This technology is a potent force multiplier in long-term survey campaigns, as it can be used to monitor the wider area around regularly surveyed channels or to highlight potentially dynamic regions that require further investigation. 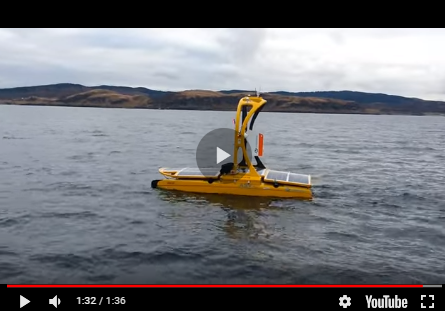 It has great potential to be used in combination with autonomous surface/underwater/airborne vehicles as it may not be economical for the vehicles to survey large areas continuously, but they could be used to fill in the areas where the radar is shadowed for example. While it is possible using existing technology to monitor the changing morphology of beaches, sandbanks and nearshore zones, the cost of repeated Lidar or manual in-situ surveys is extremely high in comparison to a radar deployment. The use of marine radar makes the collected dataset extremely versatile. A single sensor can cost-effectively produce a wealth of hydrographic information with the application of the correct data-processing algorithms, including subtidal bathymetry down to water depths of 30-50m, intertidal topography, near-surface current directions and magnitudes, and wave statistics. The radar can also continue to be used as a vessel detection tool through interface with VTS (Vessel Traffic Service) systems, and remains an effective imaging tool that can be used to increase situational awareness in a maritime environment. Thanks are extended to the Marlan Maritime Technologies, The Centre for Global Eco-Innovation, ERDF, The National Oceanography Centre, NERC and The University of Liverpool for funding and supporting this project over the last few years. P.S. Bell, (2009) Coastal mapping around shore parallel breakwaters.Hydro International, 13 (1). 18-21. C.O. Bird, P.S. Bell & A.J. Plater (2017, In Press). Application of Marine Radar to Monitoring Seasonal and Event-based Changes in Intertidal Morphology. Geomorphology. More information on this service can be found at http://marlan-tech.co.uk/hydrographic-coastal-monitoring/ or by contacting any of the authors directly.